My lovely (and very generous) friend C took me out for a birthday dinner at Bob Bob Ricard, which is the perfect place to snuggle into a booth with someone you really like hanging out with - the drinks, food and luxurious coziness of the whole place makes it one of my favorite meals in recent memory. The "Push for champagne" button at each table sets the tone for the whole place - whatever you want, whenever you want it, delivered with charm! 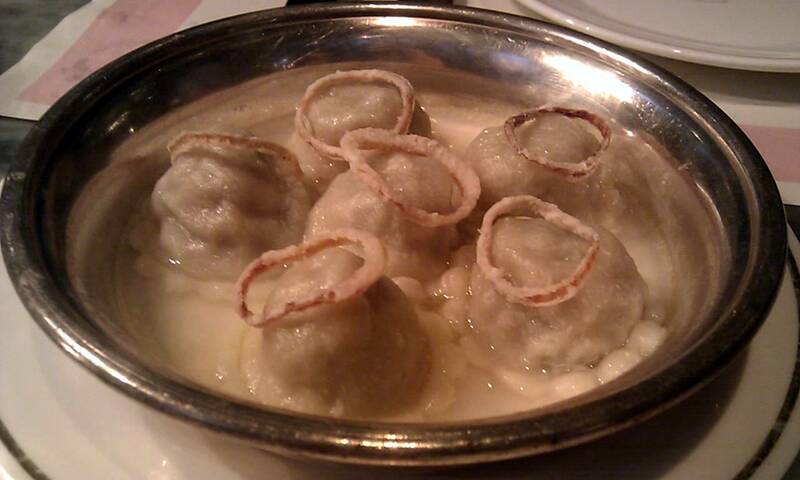 Due to the multiple drinks and courses, my memory is not the clearest, but I definitely remember having the truffled potato and porcini vareniki pictured above, each topped with a tiny onion ring. For mains we tore apart an Old Bay Crispy Chicken, which made good use of one of my favorite seasonings and paired it with the tenderness of a baby chicken. There was also a Veal Fillet Holstein, which was essentially a schnitzel topped with a tiny fried quail's egg and sitting in an incredible sauce. A shoutout to the truffled mashed potato as well, which we polished off easily, before moving on to the weirdest dessert order ever - macaroni and cheese (don't look at us that way!) and the BBR Signature Chocolate Glory, which had a beautiful dome of gilded chocolate that was then melted by the hot chocolate sauce the waiter poured over it. And of course, being extra thoughtful, my friend had also arranged for a specially decorated mini-birthday cake to appear. I am now slightly embarrassed as I read through everything we ate (and I've missed off some other bits too) - but anyone that knows me knows that feeding me is the best way to celebrate, and this is a meal I'll remember for ages.